How to keep cool in the summer weather in Rome, Italy. How to keep cool in Rome's summer heat. Please note that some links on this page are affiliates, which means that if you purchase a product through them, we receive a small commission at no extra cost to you. We only ever recommend products we know and love ourselves, and which we think would also help you. To learn more please see our affiliates disclosure policy. 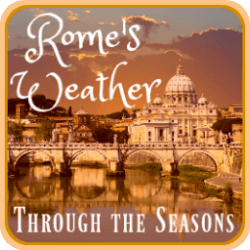 So you're planning a trip to Rome in July or August and you're wondering what the weather will be like? The weather in Rome in the summer months can be absolutely stifling. Temperatures regularly reach 40°C (104°F) or more, and the lack of a coastal breeze (as the city is inland) makes the air intensely humid. Even on a cloudy day it's easy to get heat or sun stroke which can ruin your holiday and in extreme circumstances can be highly dangerous. So it's important to have some idea before you travel about how to keep cool in the Italian climate. 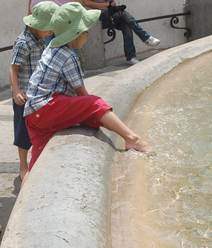 On this and our other page about how to keep cool and safe are our top ten tips for keeping cool in Rome when the temperature rises. We've assumed you will already be aware of the 'normal' courses of action to avoid sunburn and sun stroke: always use a sunscreen, keep the back of your neck covered, and wear a hat, particularly if your head is, as they say, "follicly challenged." 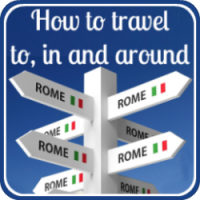 Tip 1: How to keep cool before you even get to Rome - plan ahead. 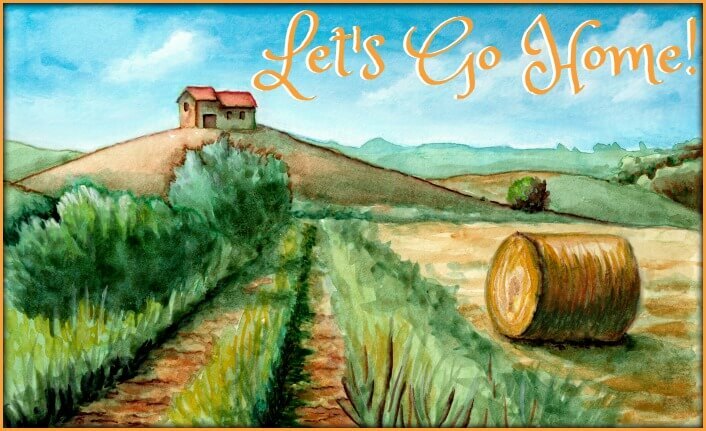 Start before you even set foot in Italy. The Italian climate during June, July, August and into September is intensely hot, so if you're travelling then you need to think about how to keep cool. Very few hotels in Rome have pools (although see here for a waterpark adventure!) but at least make sure you book an hotel with air conditioning. It's not ecologically very friendly but after a day's sightseeing it's invaluable for refreshing hot, tired bodies. Most luxury 5 star hotels and the top family hotels such as the Hotel Russie have air conditioning throughout, but cheaper hotels and hostels may not. Our featured hotels - whatever the price - all have air conditioning and some have a cool garden to relax in. Think carefully about those travelling with you. Elderly people, infants or anyone with a chronic health problem can dehydrate easily and will be more susceptible to heat. You either need to pay for a hotel with air conditioning, or travel outside the summer season. 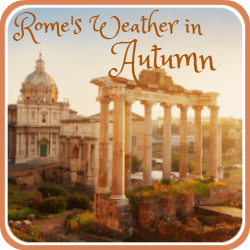 Our two very favourite seasons in Rome (although there's never a bad time to go) are the Spring, when it's pleasantly warm rather than overwhelmingly hot, and Autumn (Fall), when the temperatures are cooling and the leaves are changing colour - it's definitely the most romantic season to visit. And remember that if you're taking pets to Italy they need to be protected from the sun too. Have a look at our twenty tips to prevent your animals getting sun stroke. Tip 2: More planning ahead - your wardrobe. Italy is an intensely fashion-conscious country and for Italian people it's important to present a "bella figura" - good impression - even in the intense heat of the Italian summer. And a "bella figura" in the Eternal City is not beach-side attire of shorts and tee shirts. Remember - this is a working capital city. Dress like a tourist and you'll immediately be a target for pickpockets and hawkers. So it's important to know how to be fashionable in Rome but at the same time take account of the heat. Take a lesson from how Italian people dress in the summer - even at beach resorts. For men it's easy: light-coloured shirts and trousers made of cotton or linen will be acceptable and stop you from overheating. For women, try wearing longer, flowing dresses made of natural fabrics - cotton or linen are best. The looser fit will allow sweat to evaporate and your skin to keep cool as air passes freely over your body. Avoid dark colours - they absorb heat rather than reflecting it. Italians naturally like bright colours, and white always looks stunning on a hot day. Long dresses also look good with flat-soled shoes which are a must when walking round the city. Comfortable sandals or walking sandals are a must - heels do not do well with cobbles and are too tiring for hot feet. Cath swears by these - they're light to pack, cool, comfortable and relatively classy. But any shoes which are comfortable for your feet are what matters. And if you find you haven't brought the right clothes, you're in a great place to shop! Try stores in the Via del Corso - Via Condotti is great to window shop but buy there only if budget is no problem! 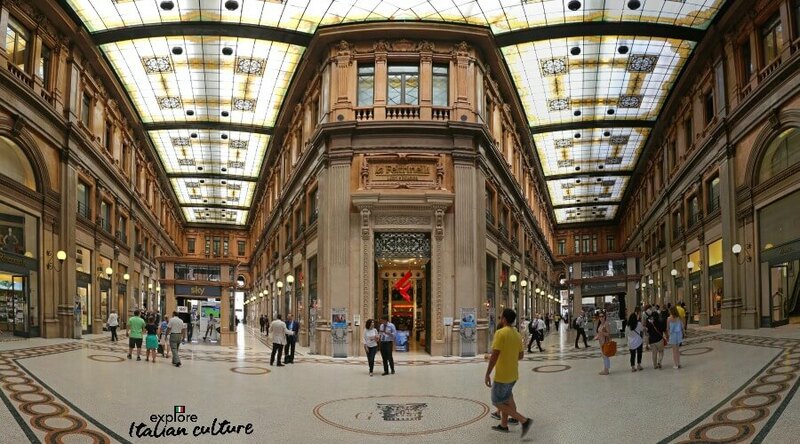 As well as high street stores on the Corso itself, the Galleria Alberto Sordi is a new and popular mall. Try it! And as a bonus - the shops are air-conditioned! Phew! How to Keep Cool Tip 3: Drink! Ever notice your family getting irritable and tired when it's hot? That's probably because they're dehydrated. And fractious children with irritated parents can ruin a longed-for holiday. The answer is simple. Drink plenty of water. Our best advice is to use Rome's drinking fountains. The water is fresh, cold and safe. 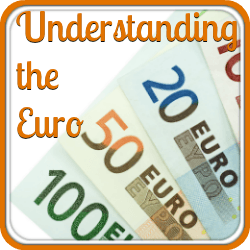 We've written up all the details about them for you in this article. Don't be tempted to climb into Rome's many decorative fountains to cool off. Kids may get away with it - adults won't! It's very tempting in the heat of the Roman summer, but you're likely to be arrested - particularly at the Trevi fountain where there are special guards whose job it is to stop anyone who looks as though they may dip even a toe in! It's fine to dip your hands though. A good tip for cooling down is to leave your wrists in cold water for several minutes. Cooling blood going through the wrists lowers the whole body's temperature very quickly. (Cath learned that little 'how to keep cool' trick many years ago when living in the heat of inland Spain - and it works!). Prefer to use bottled water? There's really no need to, with all those free fountains. But if you want to, you'll find street vendors selling bottles of various types of drink. Avoid alcohol and the fizzy, sugary drinks - they won't help dehydration. Instead, look for a stall selling frozen bottles of water and buy one for each member of the family, even (especially) children. The water will defrost slowly as you walk round, giving you a lovely cool drink for longer. Avoid buying them round well-known sites like the Colosseum though - you'll pay three or four times the price! 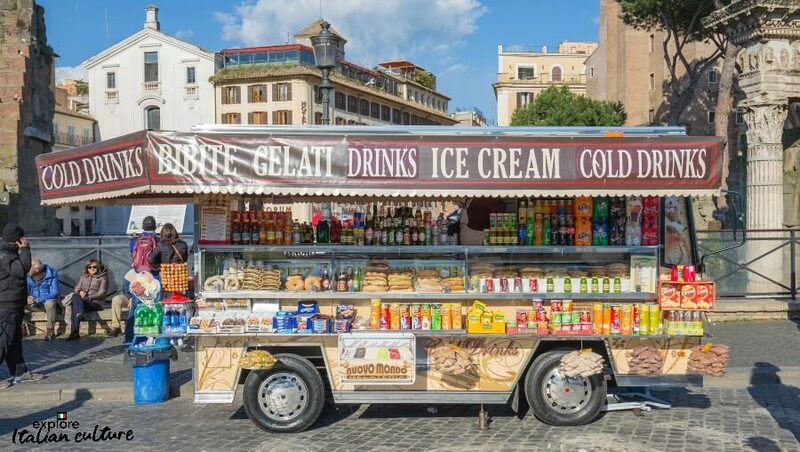 Street vendors sell drinks and ice cream all year round in Rome. How to Keep Cool Tip 4 : Don't drink! Coffee, that is. Or alcohol. We absolutely love Italian coffee. No matter what we're doing or where we are, our days in Italy invariably start with a cup of cappuccino (for Cath) or espresso (for Mike).. But Italian coffee and Rome's summer climate don't go well together. Both caffeine and alcohol cause dehydration and, together with the sun, can cause heat related illnesses. If you need your caffeine shot, try asking for an iced granita caffe. And instead of alcohol, try an Aperol spritz - a mixture of Aperol, Prosecco and soda over ice and topped with orange. Delicious - and very Italian. Another way of being a local, not a tourist! Keep cool tip 5: do as the Romans do - go to the beach! When the heat of summer hits the city, the Romans who live and work there do the only sensible thing. You may have come to Rome for the ancient buildings, the culture, the famous landmarks. But there's no harm - and a great deal of benefit - in taking advice from those who know, behaving like a local rather than a tourist, and spending a relaxing day at the beach. It's a few Euros, an hour's train ride (always an adventure) and a short walk to a small, cosy beach, crystal clear waters and a cooling sea breeze. 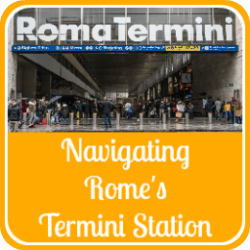 Pack a towel and swimmers and start your journey at Termini station. Trains run every hour. 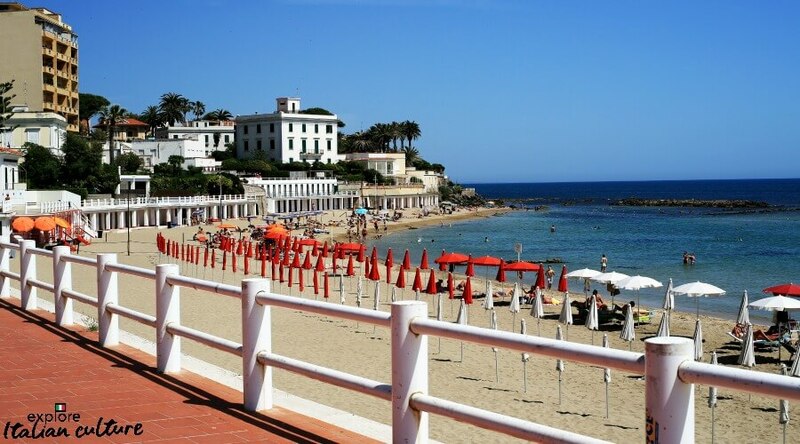 Buy a ticket to Santa Marinella (which will be abbreviated to S. Marinella). Get off the train and follow the crowds to the beach. You can either use the public beach which is free, or the paid-for umbrellas and recliners, which are well worth it. There are supermarkets in the town if you want to buy goodies for a picnic, or try one of the beachside cafes. Wouldn't you prefer to see a sight like this than another Roman ruin in the sun?! Tip: get there early. In the height of summer the beach will be packed by late morning. 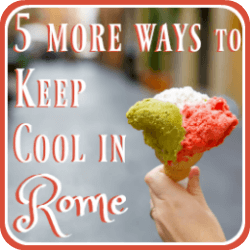 5 more tips about keeping cool in Rome. If you've enjoyed these 5 tips about keeping cool in the heat of a Roman summer, you're in luck, because we have 5 more for you. 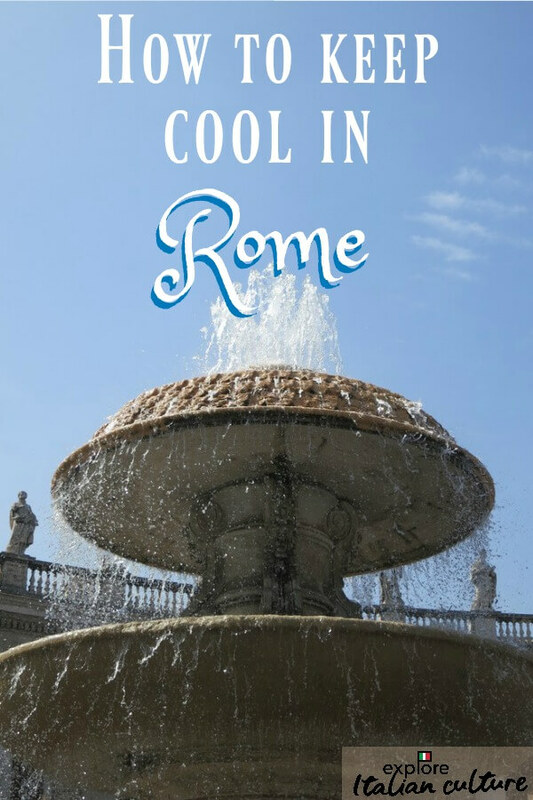 Don't let your trip to Rome be spoilt by the heat! Take these tips to heart, plan well in advance and you'll enjoy the best the city has to give. 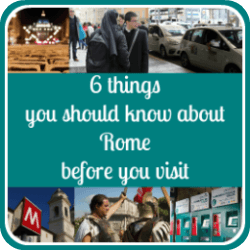 And as a bonus, you'll be dealing with Rome like the locals do, rather than as a tourist. Click on this button to see what they are. 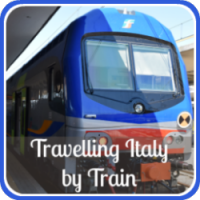 Planning a visit to Rome? You might find these pages useful.